Shield your children’s eyes, readers with heart conditions beware – today we are talking about snakes! Yesterday I was in the backyard with our dog, wearing flip-flops, as usual. As I was walking back toward the house I heard a rustling in the grass (where Mia had been sniffing just a few minutes before) and turned to see bright colors wriggling through the grass and leaves just a few feet away. 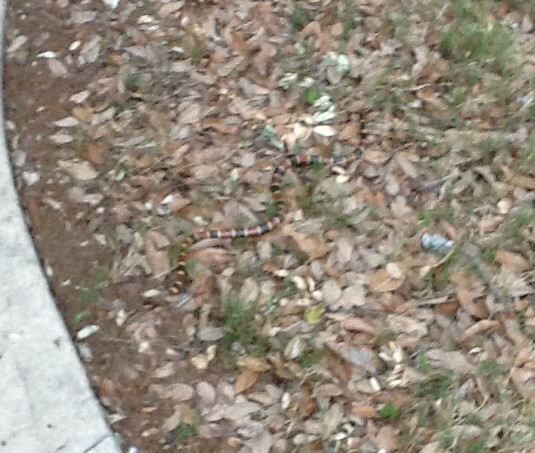 CORAL SNAKE! The nuns like to harass me for moving s-l-o-w most of the time, but I was pretty fast this time. Thank God Mia was nowhere near the snake by then, because if she had seen bright yellow bands writhing in the grass she surely would have gone for it (yellow and blue-violet are the colors dogs can distinguish best). I zoomed into the house, followed by Mia, and ran right into Sr. Mary Peter, our resident snake expert. She’s your go-to gal for info about snake sightings anywhere within the continental US, with a special focus on the pythons of the Florida Everglades (“They’ve been found as far north as South Carolina,” she likes to remind us at intervals, during lulls in conversation, and any week day that begins with T, S, M or W). As soon as she heard the words “coral snake” she jumped into action, hurrying to get my boots so this time I could battle the beast properly attired. Okay, they weren’t my boots exactly, they were rain boots, but it’s still an improvement from last time. 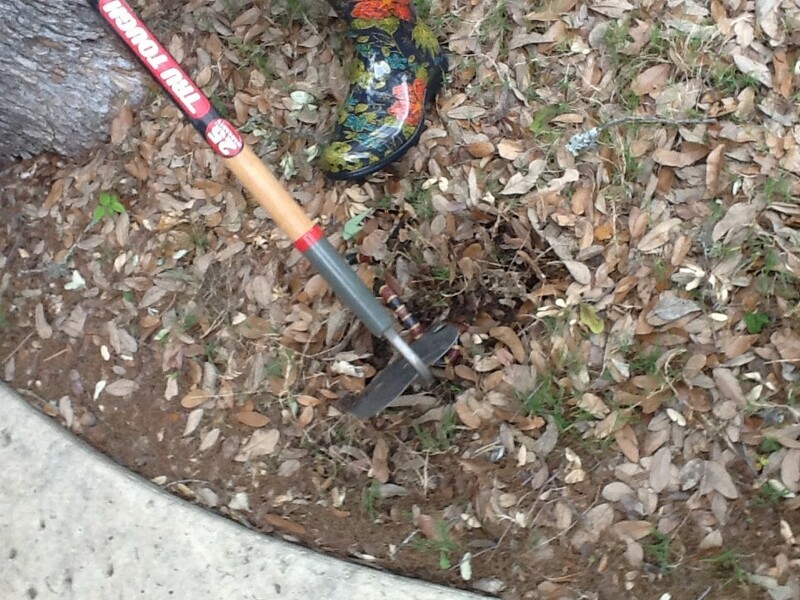 I don’t even remember how I got to the shed to get the hoe, but as I did, the snake made his way toward our house. DIspatching him was much easier this time since he was in grass, not on river rocks – no sparks flying off the hoe as metal and rock clashed in a loud frenzy of death. In other, less creepy, words, it was not so dramatic as last time, and any neighbors overhearing would not have been tempted to call the police. So I’ll be putting another notch in the handle of my trusty hoe, which really deserves a place of honor in our house. I’m thinking of hanging it over the fireplace mantel. (Sr. Grace Marie says “Don’t even think about it,” as she has officially banned dirt from our house). We know a lady who had to kill a coral snake but wanted to keep it intact so she could make some accessories out of the skin (a noble homage to snakes, fashion and recycling). They are pretty, you have to admit. I think it ended up as a band for her husband’s cowboy hat. Perhaps if I can improve my aim we could also start accessorizing our habits with the snake skins. Imagine how good they would look hanging from our cords, next to our rosaries. That would be an ice-breaker at the grocery store for sure. 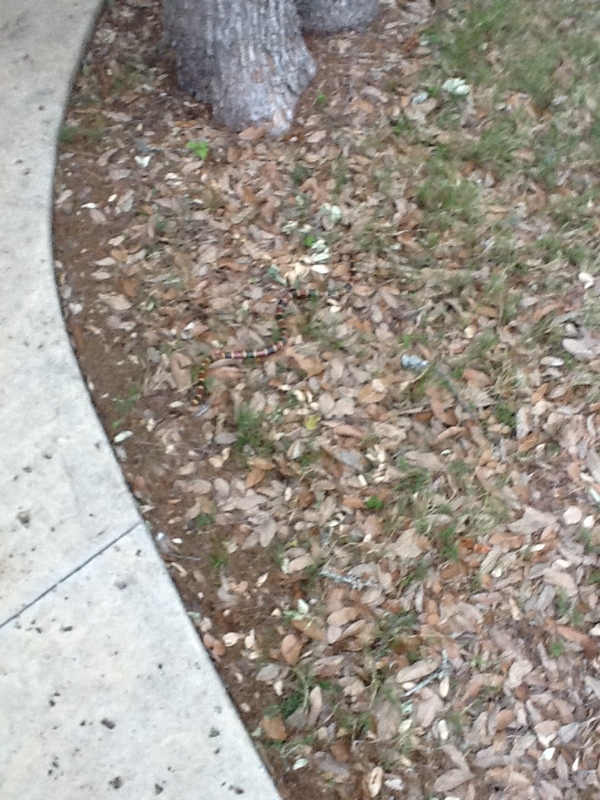 This entry was posted in A Nun's Life and tagged coral snake, nuns, snake by srelizabeth. Bookmark the permalink. As I was washing dishes yesterday afternoon my beautiful 10 year old granddaughter came up to me and asked me if I’d read the Texas Sisters blog and did I read about the sister who went for a walk and found a coral snake?! As I watched her animated face full of smiles and giggles as told me your story I said a prayer for her and I also knew I’d have to send you a comment and thank you for your blog and for giving me such a delightful few minutes with our granddaughter! This has Genesis 2:28 written all over it. We have dominion over every living thing that moves upon the earth. Nice job Sisters! Holy cats! I have been known to flee the house over a scorpion. I agree the deed needed to be done … by someone with a gun and a good aim perhaps. Good for you, sister. Now that is faith in action. You nuns are so brave! And so like Our Lady, who is excellent at snake crushing! This story makes me think of the image of Our Lady, who is so often depicted as stepping on the head of Satan! You sure are brave women! I’m just glad it wasn’t a poisonous spider (I have a phobia about spiders). I’m not sure we get Coral Snakes in Duluth, MN, but I have heard of Rattle Snakes in Southern Minnesota. Keep up the good work! Rest in peace Mr/Mrs. Snake. I will also be watching Rosary cords. I, for one, will be checking out your Rosary Cords in future sightings of our dear Sister Nuns.